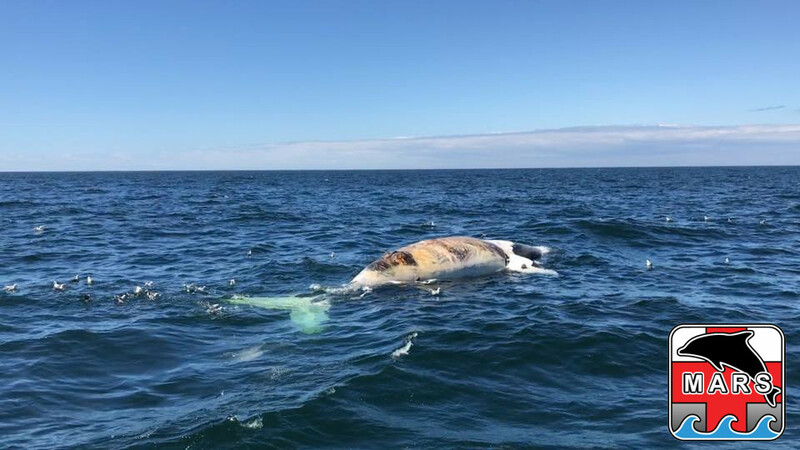 During the summer and early fall of 2017 an unprecedented mortality event occurred involving North Atlantic right whales (NARW; Eubalaena glacialis) in the Gulf of St. Lawrence (GSL). Between June and September, 12 NARWs were found dead, and five live whales had been observed entangled in fishing gear. Map identifying locations of events related to NARW incidents. Red symbols represent floating carcasses discovered at sea, yellow symbols represent live entanglements, pink symbols represent beached carcasses, and orange symbols represent sites where necropsies were conducted. Incidents that share the inverted triangle symbol represent the carcass of the same individual observed both at sea and again on a beach in NL; the animal’s identity was confirmed through genetic analysis. 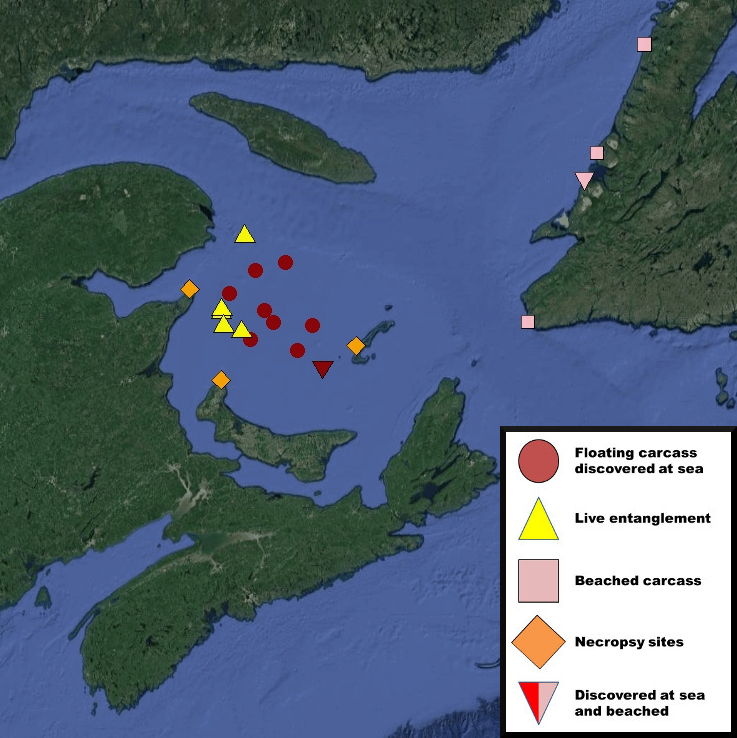 Information derived from coordinates provided in “Incident Report North Atlantic Right Whale Mortality Event in the Gulf of St. Lawrence, 2017”. NARWs are among the most endangered whale species in the world. Their populations were decimated over 1000 years of whaling that began in the 10th century and continued until the species became too rare for it to remain economically viable to hunt. However, the species faced continued risk from human activities in the form of collisions with vessels, entanglement in fishing gear, and deleterious effects from underwater noise and pollution. Slow reproductive rates of the species have always limited the recovery of NARW populations. Increasing impacts from human activities eventually negated the specie’s recovery and again caused NARW populations to decline. As a result of these declines the NARW was granted protected species status in the 1990s, though populations still appear to be in decline. A recent estimate, calculated prior to the events of this summer, suggested the NARW population consisted of approximately 458 individuals. Photo credit: Marine Animal Response Society, 2017. The unusual mortality event that occurred during the summer prompted a collaborative investigation conducted by the Canadian Wildlife Health Cooperative (CWHC), the Marine Animal Response Society (MARS), the Department of Fisheries and Oceans (DFO) Canada, and many others‡. 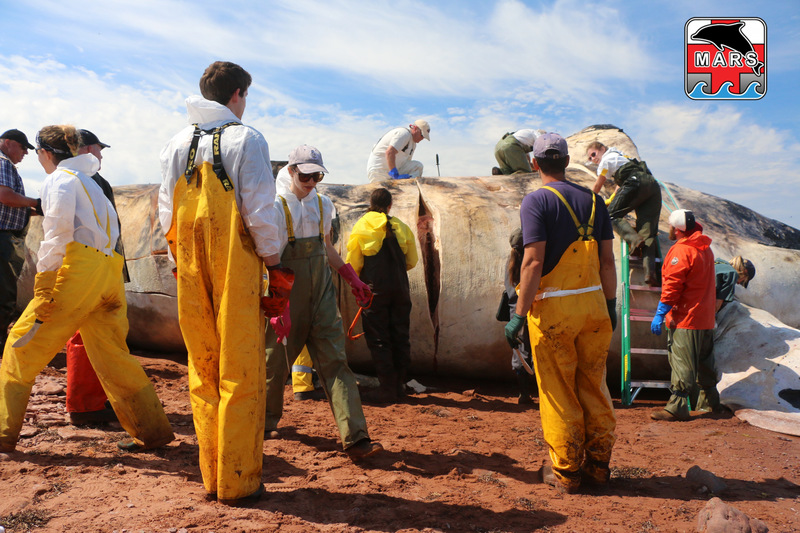 The investigation included necropsies on seven of the dead whales, as well as sampling of an additional whale at-sea led by CWHC veterinary pathologists from the Atlantic Veterinary College at the University of Prince Edward Island (UPEI), and the Faculté de médecine vétérinaire at the Université de Montréal (UdeM). Four of the examined whales exhibited lesions suggestive of sudden death from trauma. Entanglement in fishing gear was confirmed as the cause of death for two of the whales. One whale was in such an advanced state of decomposition that a definitive cause of death could not be determined, however some observations suggested the animal had died from blunt trauma. The cause of death for the whale sampled at-sea could not be determined without necropsy; however, samples collected suggest the whale died suddenly. None of the carcasses exhibited evidence of death from starvation, biotoxins, or infectious disease. The findings suggest that most of the whales examined died as a result of vessel collisions and fishing activities. The full results of these necropsies and additional testing have been documented in a joint report produced by the CWHC, MARS, and DFO. This report can be freely accessed on the CWHC’s website here. 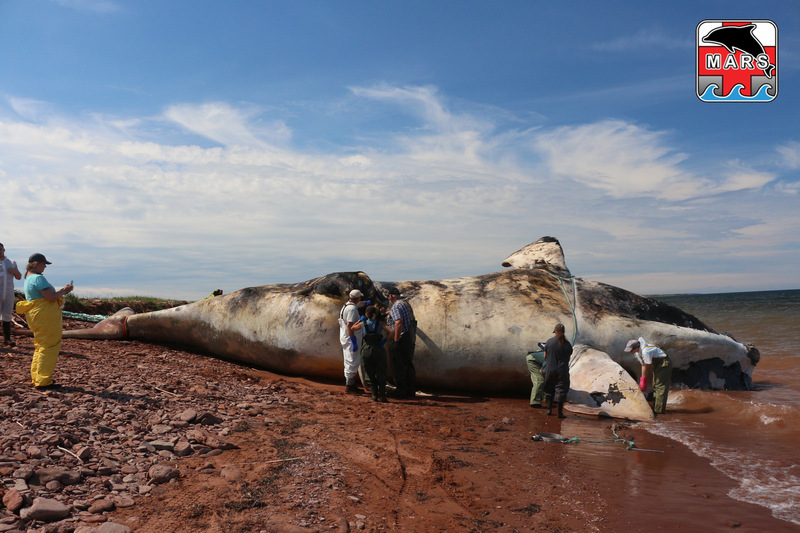 The aim of the report focused on the proximal causes of death for these whales, leaving the underlying issues that caused the mortality event outside of its scope. However, based on the results of this investigation the authors’ speculated that an increased NARW presence in the GSL and/or potentially greater exposure of NARW to human activities could have contributed to these mortalities. Discovery of carcasses may have also been facilitated by increased surveillance efforts. The report provides a vital starting point for further research and investigations that address improving practices and informing policies going forward. Timeline of events relating to the NARW mass mortality events that occurred during in the summer and fall of 2017. Incidents sharing the same symbol denote events involving the same animal. Based on information from DFO and “Incident Report North Atlantic Right Whale Mortality Event in the Gulf of St. Lawrence, 2017”.